Sturdy. Lightweight. Safe. Easy Storage. Same as orthopedic doctor. dequervains. wrist and thumb stablizer. 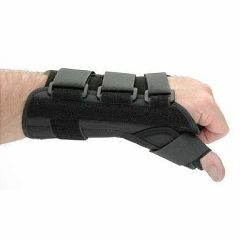 I use this product to sleep in at night to keep my wrist and thumb stabilized and so that I don't sleep on my hands. I type a great deal at work and am prone to wrist and thumb pain from pronation of wrists all day. I have worn at work, it just slows me down a bit. This is the same exact thing an orthopedic surgeon prescribed for my left hand but here it is way cheaper than what their office billed me. Definitely glad I found this product on line when my right hand started giving me trouble. People who complain about straps being too long, take scissors and cut to size, that's what the doctors office does! If you are hurting in your wrist/thumb area, this will stabilize it so it can heal. Most definitely would buy again and highly recommend Ossur products. It really does what it says! This works much better than the braces you can buy at the drugstore. It really prevents movement in my wrist and thumb. My De Quervain's tendinitis pain is greatly reduced by wearing this. It is large, but yet comfortable. Sturdy, good quality. Safe. good quality. It supports the thumb and wrist comfortably. To prevent major snagging, I cut the foot off a pair of socks and used the sock to cover the spica. I had a spica on each arm, so I increased the risk of snagging my clothes because of the velcro. I would recommend this item to others. Everything is fine except that it is a llittle bulky and I cannot do much work around the house, even though I wear a large plastic glove to protect it. Nevertheless you cannot do detailed work like cutting up vegetables, etc. The other thing that bothers me is that you yourself cannot put it on because you need someone else to close the two parts together; it is impossible to do by oneself!! !